Most days, I think of George with fondness, and remember his sweet face and how much he loved me (and vice versa). Last night, I was just really missing his presence. Cuddling with George was one of my favorite things to do! Yes, that's me in my pajamas, lounging at home on July 29, 2012. I'm not sure why I'm in flannel pajamas under a blanket in the middle of summer, but we like to keep our home cool. We can't sleep if the temperature is too high. My sister, Gail, always freezes when she sleeps over. Since this blog is focused on fashion, I will mention these P.J. Salvage cupcake pajamas. I adore two brands of pajamas: P.J. Salvage and The Cat's Pajamas. Both brands make ultra-comfortable pajamas that come in the cutest prints. I love anything with sweets (macaroons, cupcakes, etc. 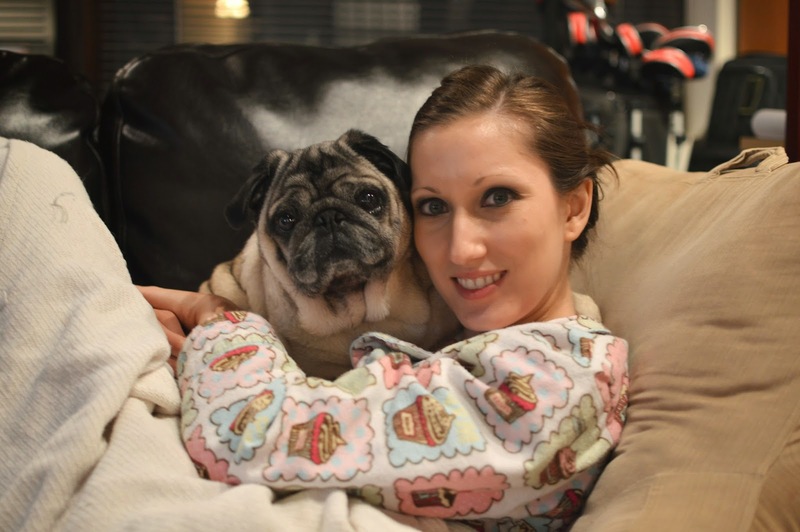 ), pugs or favorite foods (sushi!). Nordstrom Rack is having a sale on flannel P.J. Salvage pajamas. At just $12 (marked down from $58), you can't go wrong!